'BREEZY HILL' is a GREAT CHOICE for a Bahamas Vacation Home Rental. ​We offer two different accommodations for you to choose from, ensuring that your needs are fully met! You may want to rent a combination of both homes. 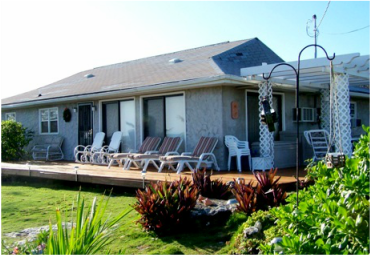 Both properties are rented on a daily, weekly, monthly, or long-term basis, and are self-catering. Read the information below for an overview of each property, or click on the name of each property below for more information! We do not charge a "SECURITY DEPOSIT" or "ADDITIONAL TAXES". We will meet and greet you at the airport and reserve a rental car for your arrival and you can follow us to BREEZY HILL and get settled into the house before going out to explore Exuma. NOTICE: We are a NON-SMOKING facility. ALL SMOKING is done OUTSIDE of the homes!! Cleaning Fee $25. per bedroom Main House/ Guest House: $50. TripAdvisor ranks 'Breezy Hill' #2 of 10 B&B's in Vacation Rentals in the Bahamas. The Main House is a self-catering facility. The two spacious bedrooms feature KING- sized beds, may be rented individually or as a whole house, where guests have full use of the large living room and kitchen areas of the home. 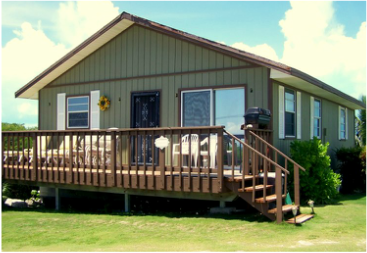 Each bedroom has a private bath, satellite TV, compact refrigerator, and a window A/C unit. The Guest House is also a self-catering facility. This two bedroom, two-bath private home features KING-sized beds, a fully equipped kitchen, and central air conditioning from 6 P.M. to 9 A.M.(when needed). The QUEEN- sized sofa sleeper in the living room will sleep two additional guests comfortably.